I love the message in the picture today but it is a side note to our message. Our message today is about being comfortable in our own skin and feeling at home with it. We are constantly being bombarded with what we should do, say and think. Our time does not always seem to belong to us. We seem to be on other people’s schedules. We tend to think that it is selfish to put ourselves first. But we need to. 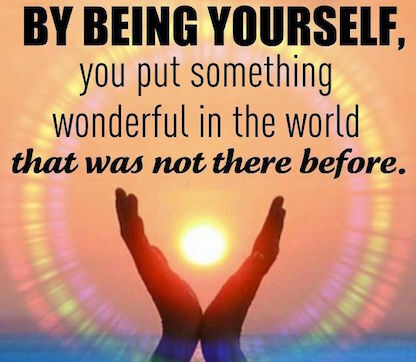 The best way for us to fulfill our life purpose and be of service is to be our best self. Think about where you feel most at home. What are you doing? When are you feeling most comfortable and natural? What makes you feel complete? What “just feels right?” When our body, mind and spirit are in sync, we know we are on the right track. It does not matter what anyone else thinks. We know what is right for us. We are reminded today to stay our course. Don’t worry or focus on what others think that is. Just be you. -Ge outdoors and take in at least 10 deep breaths. -Lots of help at the airport. -An early bedtime with a great nights sleep.